Based on the museum’s world leading Van Gogh collection and extensive research into Van Gogh’s life, experts of the Van Gogh Museum introduce an all-encompassing story of the man behind the art. The all new and award-winning traveling Meet Vincent van Gogh Experience takes audiences on an interactive journey through the life and art of Vincent van Gogh, beautifully rendered to simulate the world as he saw it. 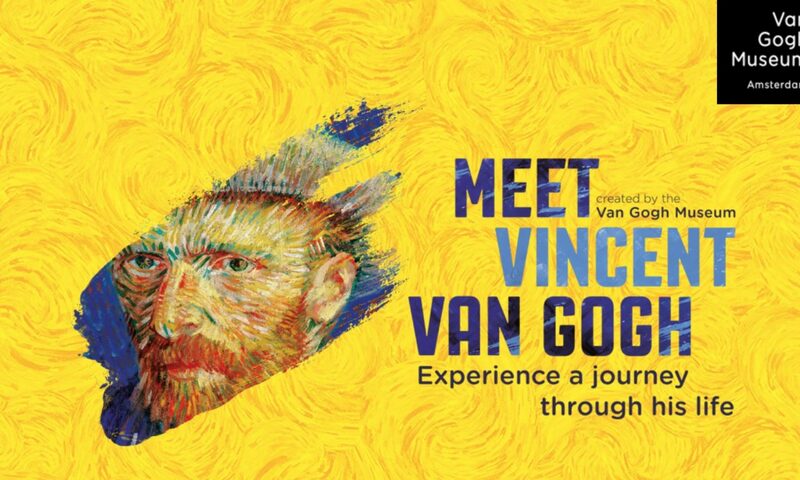 Co-created with the curators and other specialists of the world-renowned Van Gogh Museum, the one and only official Van Gogh experience is a unique journey of discovery for all ages, for artists and scientists, novices and experts alike. Visitors are invited to look through Vincent’s eyes, see what he saw, hear what he heard and read what he wrote about the pivotal moments of his extraordinary life and let his words, and those of his loved ones, guide them as they delve into his brilliant mind and troubled psyche. User experience, 3D reproduction, storytelling, art museum, 3D model, HD image, augmented reality, interactive experience, cultural heritage, narrative, documentary, interaction design, user interaction, multimedia installation, interactive installation, interior wayfinding, intergenerational learning, education, art&design. In every corner of the world, people know Vincent van Gogh. His extraordinary life and enthralling art inspire millions of people to this day. Many know him as the painter of Sunflowers or Almond Blossom, or as the artist who cut off his ear, but the story of the renowned Dutch artist is far richer and more complex than this. Vincent van Gogh (1853-1890) only decided to become an artist at the age of 27, and in just ten year’s, he created more than 850 paintings and 1,200 drawings. He also wrote hundreds of letters, in many of which he shared his deepest thoughts with his brother Theo. The award-winning Meet Vincent van Gogh Experience uses innovative techniques to tell Vincent’s incredible life story like never before. Move beyond the art to feel the craggy surface of his canvas, discover how he set to work and embark on an exciting quest through the experience. This traveling 3D Experience invites visitors to journey through the fascinating life of Vincent van Gogh, based on the knowledge and expertise of the Van Gogh Museum. The Experience offers a dramatic and tangible immersion into the story of the man behind the world-famous artist and places Van Gogh in the context of his time. Meet Vincent van Gogh also examines the motives of his artistry: to offer hope and to depict both the dominant emotions of human existence, in all their cruelty and mystery, as well as beauty. The ‘Meet Vincent van Gogh Experience’ is the only official travelling Experience by the Van Gogh Museum. With it, th visitors all around the world can explore how Vincent van Gogh became the influential, world-famous artist of today. Because of the fragile nature of the museum collection, many paintings rarely leave the Van Gogh Museum and some works never even travel. To make the life and work of Vincent van Gogh accessible to as many people as possible, the world-renowned Van Gogh Museum proudly presents Meet Vincent van Gogh: the official traveling exhibition that introduces people around the globe to the world of the famous Dutch artist. This new all-encompassing, interactive experience for the entire family illuminates the unique story of Vincent’s fascinating life, his artistic motivation and how he, well over a century after his death, remains a massive source of inspiration. Meet Vincent van Gogh reveals the most important moments of Vincent’s life, beautifully rendered to simulate the world as he saw it. As visitors’ journey through the cafés, landscapes and houses that formed the backdrop to Vincent’s life, they delve deep into his brilliant mind and troubled psyche. An audio guide, developed especially in an engaging adult and children version, leads visitors through six galleries representing various stages of Vincent’s life. Throughout the experience, Vincent narrates his hopes, dreams and intense yearning to improve directly to the visitor. It’s a high-tech, interactive experience that will have visitors thinking about art in a whole new way. It’s a chance to get up close and feel the contours of replica canvases as visitors wander through the space, with quotations from the man himself to guide them. Tactile replications of textured oil paintings, paired with interactive life-size sets – including his famous Yellow House in Arles and the Amsterdam cafés where Van Gogh scribbled letters to his beloved brother, Theo – highlight the artist’s life, not just his work. The exhibition is organised as a timeline from Van Gogh’s birth to his death at age 37. Scattered along the way are reproductions made with ‘Reliefography’, a unique 3D-printing technology developed by Fujifilm in collaboration with the Van Gogh Museum. Guided by quotations from personal letters, lifelike reproductions and audiovisual scenes from his artworks, life and environment, visitors witness Vincent unfold as a man and as an artist. Visitors are challenged to engage in interactive activities such as drawing using a perspective frame, portrait drawing and digitally painting using the colors from Vincent’s palette. The experience invites visitors to jump into the science behind the art and discover what we’re still learning about this passionate and dedicated artist. They can feel the craggy surface of Vincent’s canvases, see the streets of Paris as he saw them and hear the wind rustling through the wheat field where the famous artist spent some of his last moments. It is now possible to get closer to Vincent than ever before. Interactive walls show hundreds of the van Gogh paintings that are now in global collections, and visualizations by his contemporaries and followers including: Paul Gauguin, Pablo Picasso, Piet Mondriaan, Roy Lichtenstein, David Hockney, Francis Bacon, and various writers, filmmakers and designers who demonstrate an ongoing influence van Gogh has on cultures throughout the world. Experience explores the life of the artist through life-sized projections of his works, photographs, reproductions, interactive multimedia, theatrical scenery pieces, audio-visual elements and more. The large-scale scenery pieces include famous locations from the artist’s life, like the Parisian café Le Tambourin, the institution in St. Remy where Van Gogh was admitted, and the Yellow House in Arles, which is featured in some of his most famous paintings. The exhibit was created by the Van Gogh Museum in the Netherlands. 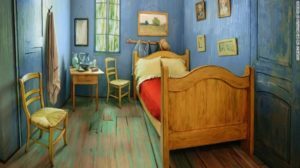 Axel Rüger, the director of the museum, said in a statement that Meet Vincent van Gogh is primarily focused on visitors experiencing, discovering and trying things for themselves. On doing as Vincent did, the visitor gets closer to the life story and the world of this acclaimed artist. For example, in the opening scene, visitors find themselves in the middle of the wheatfield where Vincent fatally wounded himself. They are alarmed by the pistol shot ringing out, see crows flutter into the sky, feel the Provençal breeze and hear the voice of Van Gogh quoting from one of his final letters to Theo. The visitor becomes an integral part of this lifelike scene”. Visitors can listen to the story of Vincent’s life, which is being told in his own words. The experience features two audio guides, developed especially both for adults and for children. One can learn to draw landscapes with a perspective frame. Visitors can investigate the details of Vincent’s paintings through a microscope. Experience pulling up a seat at ‘The Potato Eaters’ table or see a dramatic shadow play in the Yellow House. Still, however novel it might seem to explore art 3-dimensionally, it is not new to incorporate modern technology and multisensory dynamics to a museum exhibit. Dreams of Dali opened in January at the Dali Museum in Florida. It featured three virtual reality stations with headsets that incorporated Oculus Rift technology to give a 360-degree vision of the Spanish Surrealist painter’s works. Users can experience life-size reproductions together with pre-build surroundings for immersive experience. Courtesy of Meet Vincent van Gogh Experience. The experience combines the artist’s life, work and quest. Guided by facsimiles, audio-visual and digital applications, quotations from letters, life-like reproductions and scenes from his artworks, life and environment, visitors virtually travel through the artist’s life, and thus experience for themselves the story of the person behind the paintings. 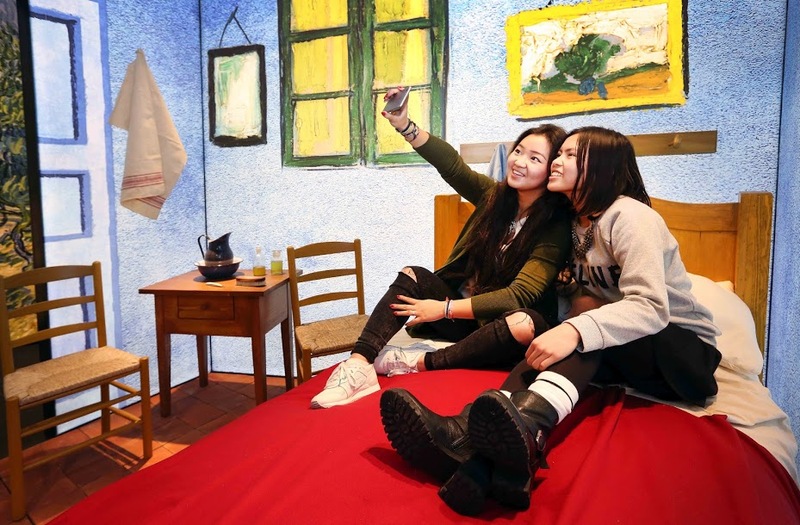 The first Meet Vincent van Gogh experience was launched in China in the summer of 2016. Content goes here The Van Gogh Museum closely collaborated with a team of specialists during the development and construction of Meet Vincent van Gogh. 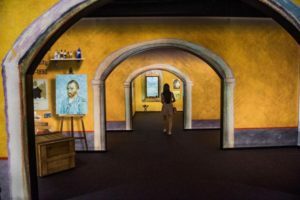 In line with its mission to offer visitors a fully immersive experience, the museum joined forces with brand/product developer and management company ArtComm Inc., ultimately combining their expertise in Meet Vincent van Gogh Experience Inc. This company now focuses its efforts on bringing Meet Vincent van Gogh to a varied, international audience. Technology gives us opportunities to do and make experiences much richer. It was the intention of production team to make it appeal to all of the senses. They used extremely high quality blown up illustrations of some of the work taken very close to the brushstrokes. Producers have filmed on location the different places where van Gogh lived and have also used historic footage in it, and then produced scenarios where visitors are walking through Vincent’s life; for example, they created a Parisian cafe scene with 3-dimensional crops, and an impression of the hospital so visitors get a real physical sense of the environment. Visitors can literally smell straw in The Harvestand sit on van Gogh’s bed in The Bedroom, touch the brush strokes on his art, and try their hand at drawing with his tools. They are guided throughout the experience by a narrative that uses a modern script including quotes from Vincent and those in his circle. Six comprehensive chapters replicate van Gogh’s paintings and working spaces, and tell the story of his life as an emerging artist in the Netherlands, his time in Antwerp and Paris, his home in the south of France, a period of illness, and his ongoing legacy now 125 years past his death. From the cracks in the paint to the original frame and museum labels on the back, these reproductions are 99 percent similar to the originals. The digital and interactive elements, and an environment that’s more relaxed than a museum or gallery, allow visitors to respond to different learning styles: some people like to listen to things, some people like to touch, so the experience wants to create something broadly accessible. Replications used in the display, created by the Van Gogh Museum, are seriously lifelike and let viewers interact with priceless ‘paintings’ in ways that museum-goers aren’t typically used to (including touching them). Don’t miss the larger-than-life recreation of The Harvest. Meet Vincent features a recreation of the Yellow House in France where the duo lived; here you can learn the story of their dramatic parting and Van Gogh’s ear-cutting incident that followed shortly after. A wall filled with images of pieces created by other artists inspired by Van Gogh’s work. From fashion collections to photography and paintings, this creation, located at the end of the exhibition, shows viewers just how relevant the Dutch artist still is. Michael Grubb Studio provided technical lighting design support for the new ‘Meet Vincent Van Gogh’ traveling exhibition. They worked in partnership with multi-award winning Event Communication, a leading experience design agency, recognised internationally for their consistent ingenuity, design and ability for purposeful storytelling. The exhibition is a truly multisensory and interactive experience that uses innovative techniques, high quality reproductions and impressive visual effects to tell Van Gogh’s incredible life story. Producers also developed an initial lighting strategy that dealt with key strategic issues, such as wayfinding, light adaptation, contrast ratios and also glare. The strategy also advised on technology and key technical requirements. This was specifically relevant to the large light-box displays and how they supported AV related content. The Meet Vincent van Gogh Experience does not present Van Gogh’s original artworks, as they are too fragile to travel. Instead, the story of Van Gogh has now been made accessible to visitors all around the world by means of the use of state-of the-art audiovisual techniques. The only official Experience by the experts of the Van Gogh Museum. explore the world of Vincent van Gogh. A multisensory exhibition with a flexible layout. Designed for all members of the family, novices and experts alike. Meet Vincent van Gogh represents the quality and added value for the audience of the experience. The multisensory concept in which they tell the story of world’s best known Dutch artist Vincent van Gogh is seen as highly impactful. Visiting the experience is not only an educational experience but most of all fun and therefore represents an example of good practice for innovative audience building. The mission of the Van Gogh Museum in Amsterdam is to make the life and work of Vincent van Gogh accessible to as many people as possible. The objective is to enrich and inspire others. Guided by quotations from personal letters, lifelike ‘Relievo’ reproductions, photographs and spectacular audiovisual scenes from his artworks, life and environment, visitors of all ages embark on a journey through the most important moments of the life of the world’s best known Dutch artist. The beautifully simulated environment brings a comprehensive perspective on the life and work of the artist to locations where his paintings, letters and works of paper are now too fragile to travel. The audio tour, the heart of the tour, brings numerous figures to life: Vincent himself, his brother Theo, his sister-in-law Jo, his mother and other key persons, and their stories guide visitors through the various scenes and phases of Vincent’s life. The audio tour is based on the huge numbers of letters in the museum’s collection. scientists, novices and experts alike. at The Potato Eaters table or at Café Le Tambourin in Montmartre. Investigate the details of Van Gogh’s paintings using a microscope. Step into the life-sized Yellow House and engage with a dramatic shadow play. Savor Vincent’s legacy and contemplate his role as an enduring source of inspiration. While it does not seem as riveting as what modern technology could aspire to with Oculus for instance, the experience is certainly a refreshing change of pace for modern times, and it remains to be seen how it may be met in other countries- as well as what technology may become more common to art exhibits globally in five years time from now.